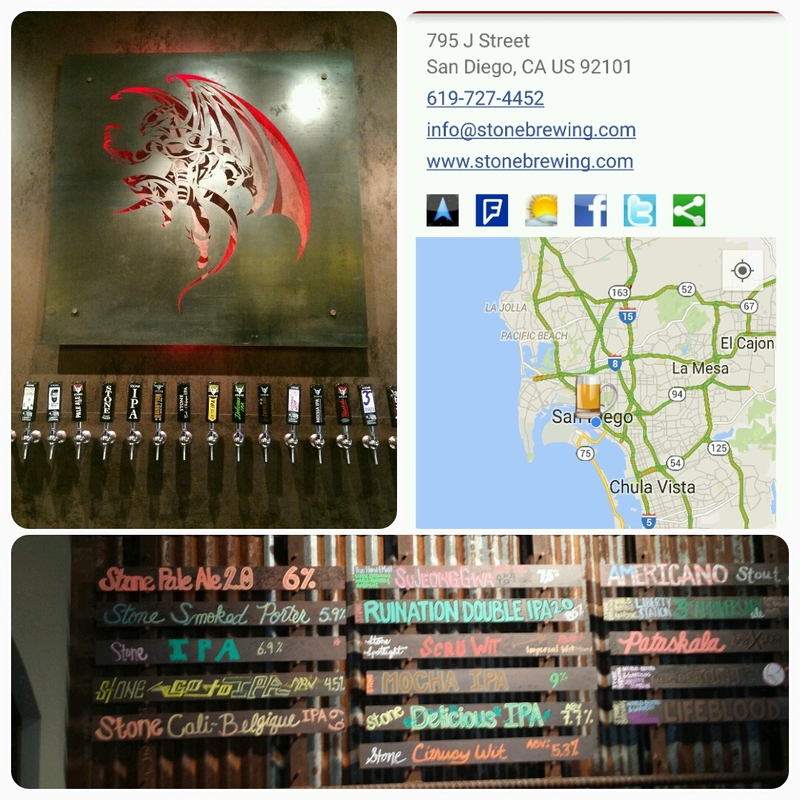 San Diego is craft beer heaven. I know there are other awesome craft beer cities like Portland and Denver but combine the weather, the beaches, and an accommodating baseball stadium and you get America's Finest City. First, let's look at the numbers. 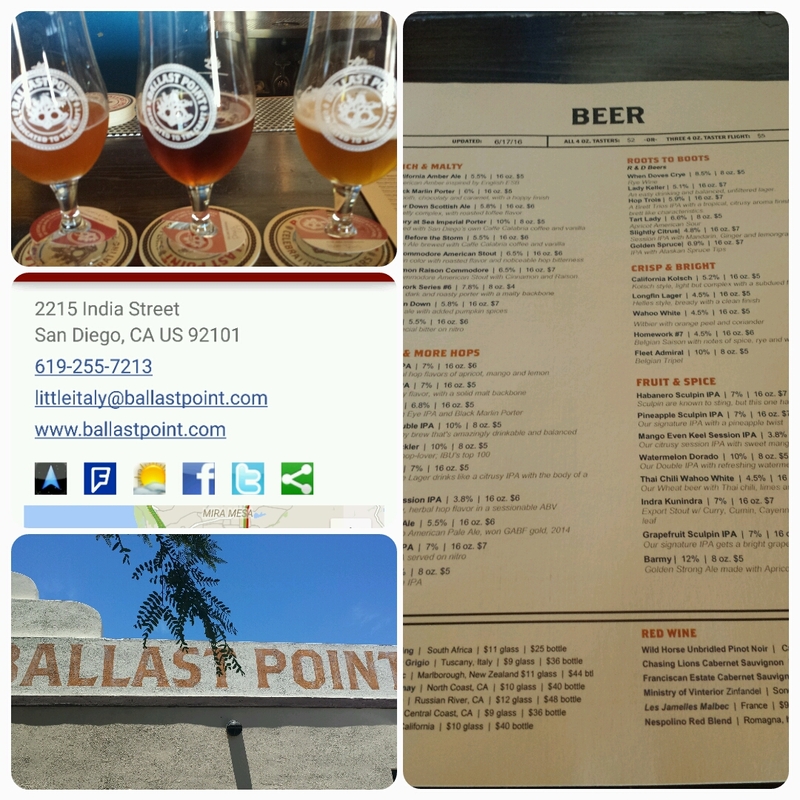 There are approximately 80 tasting rooms within city limits and a few of these are giants like Ballast Point Brewing Company and Stone Brewing. 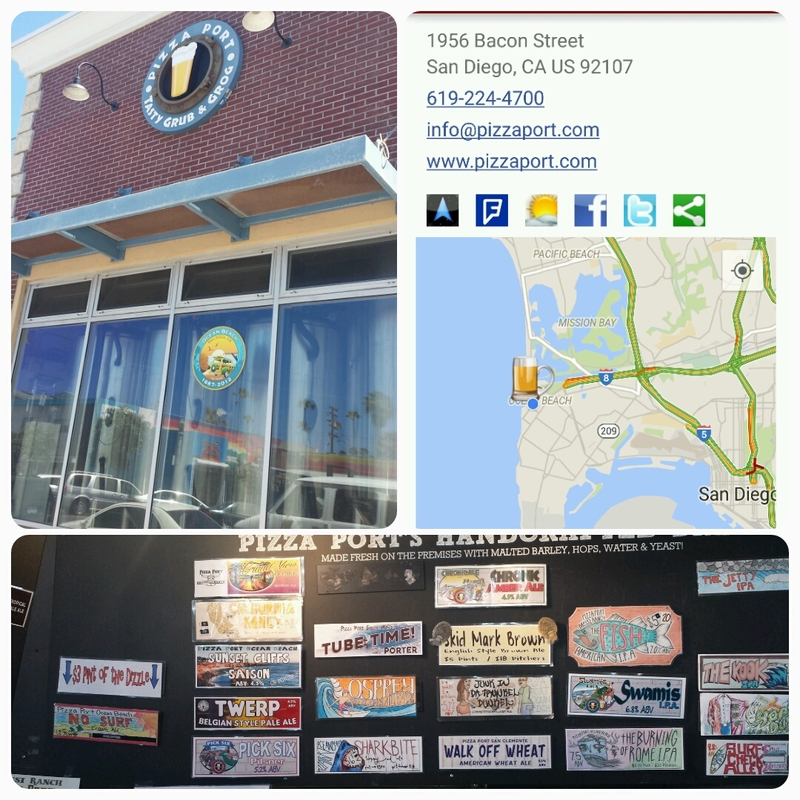 Others, like Pizza Port and the Karl Strauss Brewing Company, have numerous venues scattered throughout the city. Second, there's Petco Park stadium which embraces craft beer - not just tolerates it. See the Ballpark & Brews post. And finally, the beer is unique, interesting, and delicious. 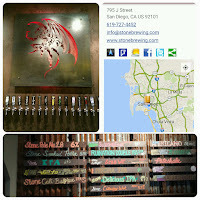 On our arrival and quick hotel check in across from Petco Park we headed over to the Stone Brewing Tap Room located conveniently just outside the stadium. The tap room provides a host of Stone brews, most very IPA-centric, but enough options for our heavily weighted Miller Lite group. I choose the Citrusy Wit and finished my Father's Smoked Porter before heading to the Tilted Kilt for lunch. Both solid beers for their respective styles. At the Kilt I went overboard with local beer starting with the AleSmith Brewing Pale Ale .394, then moving on to the the Coronado Brewing Company Berry The Hatchet, and finishing with the Ballast Point Pineapple Sculpin. The later was slightly sweeter than the Grapefruit Sculpin, the Coronado fruit ale tasty, and the AleSmith my favorite of the trio. 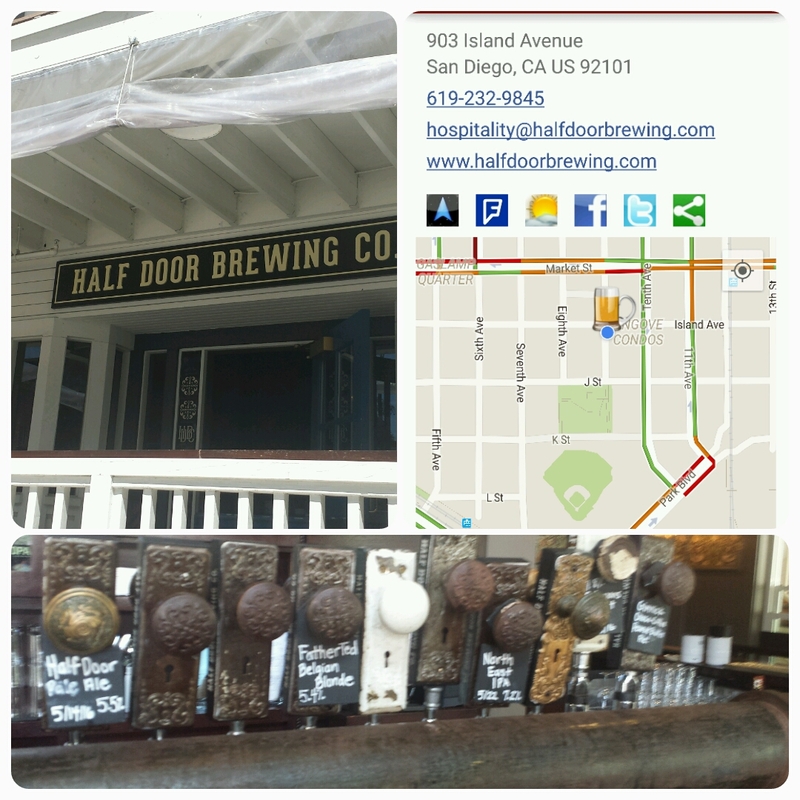 After putting the padre to bed for a nap, I ventured ahead to Half Door Brewing Company, named in honor of the Irish pubs and farmhouses where half doors were a way to let fresh air in and keep the nosy farm animals out. The brewery sits in an eccentric historic house with a large front porch and divided second floor seating. Great architecture. I started with a favorite style, the Bearleener Berliner Weisse and it was tart and fruity as expected. 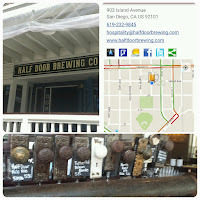 When the crew eventually caught up most of us turned to the Half Door Pale Ale - a beer that found common ground between the IPA and lite beer drinkers. This beer left us in a cheerful state heading into the stadium. Day 2 started with an Uber to Ocean Beach to visit relatives, walk in the ocean, and stroll the pier. Afterwards Pizza Port Ocean Beach was a short walk away for lunch and we came away impressed with the food and the beer. 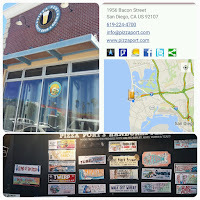 My favorite was the No Surf Cream Ale - a refreshing summer ale, while my brother looked favorably upon the Swami's IPA and my father stuck to his porter - the Tube Time Porter. 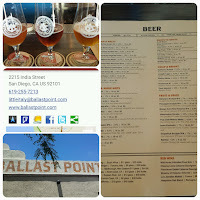 Our return Uber ride detoured into the Ballast Point Tasting Room & Kitchen Restaurant, a satellite venue in Little Italy. I knew it was a wise decision when we met Bob Carpenter, the MASN TV voice of the Washington Nationals, coming out. I selected three different beers for my sampler and fell in love with the Tart Lady a Wild Ale exuding juicy and tart apricots. The other two experimental ales just weren't for me. The Hop Trois IPA was funky but seemed unbalanced and the When Doves Crye Rye Wine was tense and spicy - too much for my palate. But a sifter of the Tart Lady quickly it washed away. And once again I finished my Father's porter, this one the malty Black Marlin. I'm returning to America's Finest City later this summer and I will be using theCompass Winery, Brewery, Distillery Locator Mobile App to visit several breweries that I lost time - particularly Mission Brewery and Monkey Paw Brewing. Cheers.